Yuri Kochiyama will most widely be remembered for what she held in her lap. In 1965, she cradled El-Hajj Malik El-Shabazz (Malcolm X) in her lap as he lay dying, gunned down in Harlem’s Audubon Ballroom. I read and admired Malcolm X, but I will remember Yuri, not for that iconic picture, but in her own right. I will remember her lifelong fight for justice and for the small moments I shared with her. In Yuri’s lap, I learned how to be unafraid of those in devastating pain and hold folks close to my heart with love. In Yuri’s lap, I learned how to commit myself to the struggle for women’s liberation. In Yuri’s lap, I learned how to walk the path of militant motherhood. 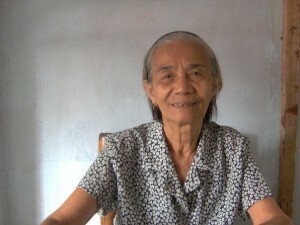 She was 84 years old when I met her in 2005. I was a young woman right out of college. 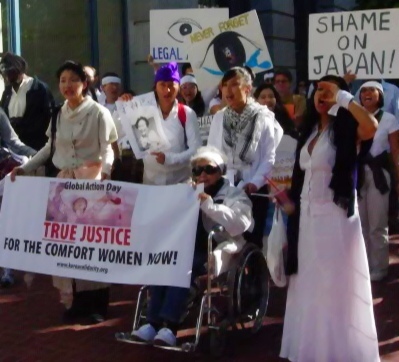 The Japanese government had not given a formal apology to the women forced into sexual slavery during World War II and I gathered with other women for the Global Day of Action for Justice for Comfort Women. I was there speaking on behalf of GABNet, now known as AF3IRM, nervous in my role as Coordinator for the San Francisco Bay Area Chapter and in awe speaking alongside friends Miho Kim, Sug Ok Shin, and Yuri Kochiyama. Yuri folded her hands in her lap as we planned our chants for the rally in San Francisco. She turned to me and said, “You help come up with the chant, Katrina.” I took a big gulp and began “Tujaeng, Kaihou, Makibaka,” urging the crowd to “Dare to Struggle” in Korean, Japanese and Tagalog. The fire was palpable as they chanted back. She reached out to me, held my hand and beamed a huge smile. Yuri carried herself with zero ego and was often the first person at an action in her wheelchair. She had this infectious way of making you feel like your goodness mattered, as if that small stand cracked a dent in the monstrous machine of oppression. As I continued my work in the women’s movement, she encouraged me. I took a sabbatical in the Philippines and spent some time with the former Comfort Women. These Lolas (grandmothers) reminded me of Yuri—so funny and absolutely unafraid of standing up to imperialist governments. I made kuwento (talked story) with Lola Narcisa Claveria and she told me how she came to be a Comfort Woman. The Japanese went into her house, bound her father and forced him to watch as they gang raped her mother. They burned her parents in their family house and took her and her sisters so that they could see there was no home to come back to. Yet she was still matapang (brave) and she scolded me for getting sleepy in the heat and made me wake up from siesta to karaoke with the Lolas before we went to a rally to protest. If Lola Narcisa could still fight and sing, what excuse did we have to be tired after a long day? But after I had my daughter Tala and under the weight of health complications I ignored over the years, I became tired and burned out. I took a break from the movement. Yet I had no idea how bored and restless I would be living an apolitical life. I had to return. Two days after Tala’s first birthday, I wrapped my baby up in a sling on my chest and we went to our first protest together. We went to the Mayo Uno protest in San Francisco for International Workers’ Day, because I have never been able to forget my past as an undocumented immigrant. But this was the first protest I had gone by myself instead of marching with a contingent. After years of speaking to crowds of hundreds on behalf of GABNet/AF3IRM, I had forgotten how much social anxiety I had on the other side in the middle of a large crowd. I walked a few steps and felt so nervous my hands shook. 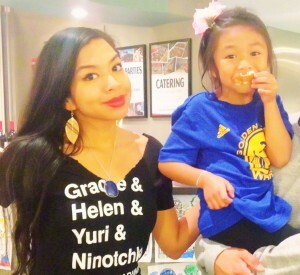 For Tala’s first protest, Yuri Kochiyama held her in her lap. I was stunned that she could be so kind when I felt completely out of place. We talked for hours while Tala fell asleep in her arms. We laughed too much and forgot to take photos. I asked Yuri, “How do I do this? How do I live a political life with motherhood?” I was exhausted, but Yuri made it seem so easy. It was a small moment, yet It transformed the way I saw myself and reinforced my purpose to uplift mothers in our participation at the head of the struggle. I am just one drop in the vast ocean of sisters and brothers whom Yuri has influenced, but anyone who has seen my child commenting on patriarchy and capitalism at actions and meetings knows I have worked to live up to Yuri’s advice. Her spirit is strong. In AF3IRM, we are exponentially growing our women’s collectives with mothers in nearly every chapter’s leadership. We turn to our sisterhood and raise our children together in the struggle. This summer we will launch our children’s school for political activism and will do so in your name, Yuri. While early martyrdom is often valued more as as glamorous, we consider your abiding stamina as a warrior for justice–one that lasted nearly a century–an enduring legacy for all women. You held death and new life in your lap. You held us all up, Yuri – and we will not let you down. Katrina with her daughter Tala. Katrina Socco is the National Programme Coordinator for AF3IRM, an expert level healer in white light reiki, and national consultant on youth leadership and social justice strategies having trained over 15,000 people. She writes on militant motherhood and non-feudal parenting of her daughter Tala. They live 100 steps from the Pacific Ocean and sing to Yemaya, nightly. Beauriful piece, Katrina. Thanks so much for sharing this. Thank you for sharing your story. Beautiful.